Eurovision Semi-Finals allocated! 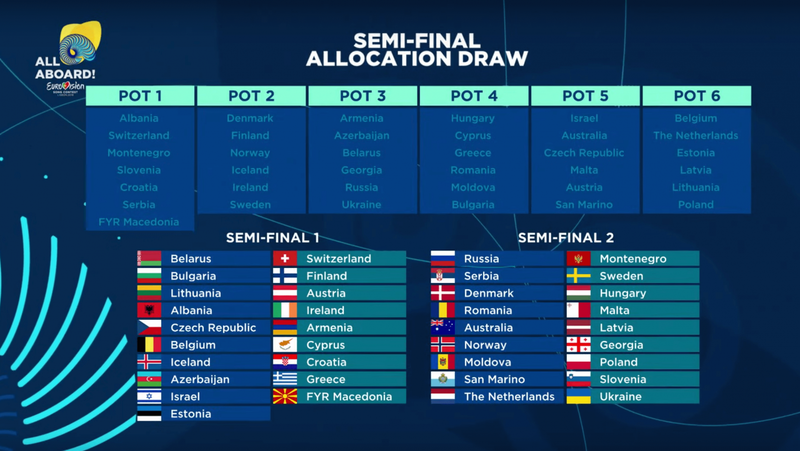 Find out the results of the Draw! The draw was hosted by Slivia Alberto and Filomena Cautela, half of the hosting team for this year’s contest. The event saw the handover of hosting duties between Vitali Klitschko, the mayor of Kyiv, the 2017 Eurovision host city to the mayor of Lisbon, Fernando Medina. First, the results of the Big 5 draw. Spain, the UK and Portugal will be voting in the first semi-final, while Germany, France and Italy will vote in the second semi-final. Italy’s broadcaster RAI filed a request to vote in the second semi-final, and this request was approved by the EBU and reference group. Due to an uneven number of participants this year, semi-final 1 will feature 19 entries, while semi-final 2 will feature 18 participants. Now that the semi-final allocation draw is complete, the next wave of tickets will go on sale on the 30th of January. You will be able to buy tickets for all shows for both semi-finals, including jury and family shows, and the live semi-finals. Tickets will go on sale at blueticket.pt at 11:00 CET.